The Republic of Ireland are to play France in an international friendly at the Stade de France on 28 May. It will be their first match against the French in Paris since the Thierry Henry handball incident during a World Cup qualifier in 2009. The nations last met in the last 16 stage of Euro 2016 in Lyon with France winning 1-0 on their way to the final which they lost to Portugal. France will use the May fixture as part of their World Cup preparations. Under coach Didier Deschamps, the French topped Group A in the qualifying campaign. Martin O'Neill's side failed to qualify for the finals in Russia, losing to Denmark in the play-offs. 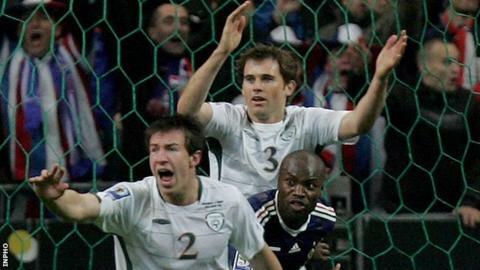 The 2009 Henry handball incident caused uproar in Irish football circles and it later emerged that Fifa paid the Football Association of Ireland 5m euros to avoid a legal case over the matter. France had won the first leg in Dublin 1-0, but in the return match Robbie Keane scored to level the tie overall. The Republic were 16 minutes away from a penalty shootout when Henry handled in the build-up to William Gallas's extra-time goal which gave France a 2-1 aggregate win.